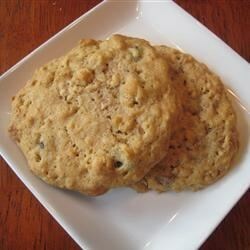 "Jumbo breakfast cookies are perfect for grabbing on the way out the door. Feel free to substitute chocolate chips or dried cranberries for the raisins or any combination of the three for a little different twist." In a very large bowl, mix together the sugar, peanut butter, butter, water, vanilla and eggs until smooth. Combine the flour, baking soda and salt; stir into the batter. Mix in the oats and raisins, then carefully stir in the cereal. Drop 1/2 cupfuls of dough onto ungreased cookie sheets, spacing cookies about 4 inches apart. Flatten cookies to 1 inch thick. Bake for 12 minutes in the preheated oven, until cookies are lightly browned at the edges. Let stand on the cookie sheets for 5 minutes before removing to wire racks to cool completely. Store at room temperature. I like to put each cookie into a sandwich bag which makes them easy to grab on the way out the door. What a disappointment these cookies were.... dry and literally fell apart in crumbs. Don't think they made the cut. Sorry! WOW! These are great for a healthy snack or breakfast. I changed the all purpose flour to whole wheat flour to make this a much healthier option. You can NOT taste the difference.